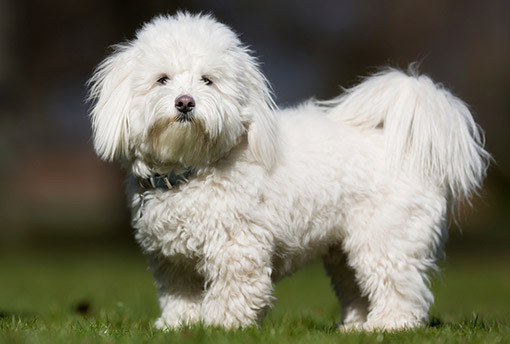 The Coton de Tulear, also known as the Royal Dog of Madagascar, was first recognised in 1990 but he has existed in his native Madagascar, particularly on the island of Tula, for several hundred years. Although very few have been exported from Madagascar, the breed is becoming more popular in the USA, Europe and the UK. The Coton de Tulear earned his name in part from his unique cotton-like hair, which is very fine and dry to the touch. Intelligent, courageous, calm, and willing to learn. Friendly and Faithful. He can be quite a clown, and will play to the crowd if given the opportunity. Small, white dog. Slightly longer than high. Long coat of distinctive texture. Height: 25 - 32cm, weight: 5 - 6 kg. No significant health problems, except patella luxation, although the eye conditions and progressive retinal atrophy and CMR2 (canine multifocal retinopathy type 2) are also known. There is no shedding and the breed rarely affects people with allergies, however regular brushing and combing is necessary.